"It is only within us that landscapes become landscapes. That's why if I imagine them, I create them; if I create them, they exist; if they exist, I see them ... The traveller is the journey. What we see is not what we see but what we are" (Fernando Pessoa). The landscape is an inner entity defined by our look, educated by our knowledge. The idea of landscape is ever changing, it is the reflection of the cultural bond between the man and the environment. Capri is the romantic landscape par excellence, rather it is one of the prototypes shaping the idea of the late romantic landscape. One of the tools that a landscape painter used to bring along was a peculiar viewfinder, a grey cardboard sheet with a hole, that allowed to isolate the colour from the context in order to observe it without interference. 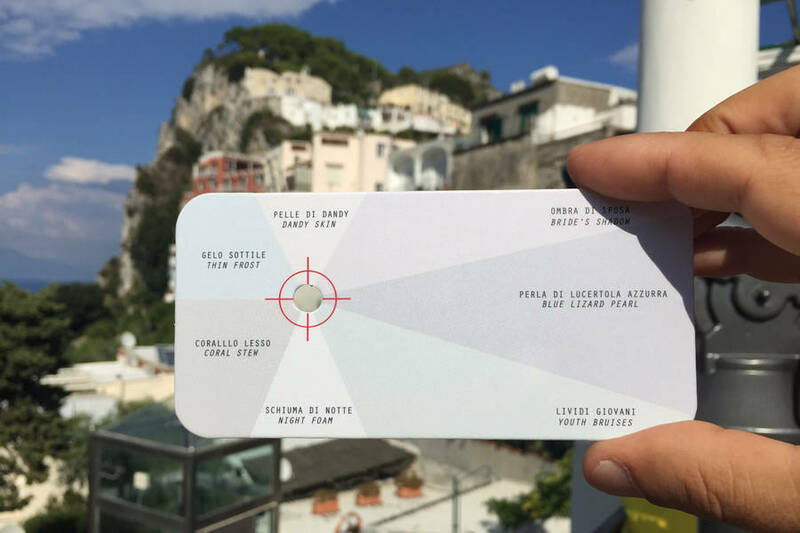 By using a similar tool, Alessia Armeni is inviting the audience to find the colours within the landscape of Capri that she has selected and to which she has given a name. She has identified the colours within the endless range of shades of white. White is the most ambiguous colour. We call white what we know as such: we will define white the white sheet of paper if we either observe it under the blinding summer light or in the shadow or in the warm light at dusk, even if its actual colour has turned to light blue, to grey, to pink, and so on. When we fix shades of colours, by giving them a name, then they get their identity: ivory, ice, milk. Colours, as landscapes, exist and we recognize them only after a cultural process of identification. The names used by Alessia Armeni to define the colours of this project aim at recalling inner images, a monad of landscape. The choice to create an artwork which is a tiny pocket tool, to be printed for circulation and to be distributed like a promotional material, bears an internal question about what distinguishes an artwork from a gadget, an operational item or a postcard; the - more than open - question is replied by the caption printed on the back of the item where, besides the title of the work, are usually mentioned the details of the size, the technique and material used. Alessia Armeni lives and works in Rome. She graduated in art painting at the Accademia di Belle Arti of Brera, Milan, in 1999. Since 2009, she is been developing through the painting and other media a reflection about the colour, particularly as concerns the concept of white, as element of investigation and representation of concepts such as the passing of time, the identity and the denomination. Her works have been displayed in Italy and abroad; among the personal exhibits: Abbaglio nitido, Spazio Varco, L'Aquila, 2016; Tilt, Spazio Y, Rome, 2015; Tiempo-Espazio-Luz, curated by Karen Huber, la 77, Mexico-City, 2011. 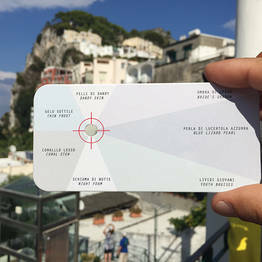 A selection of the latest collective exhibitions include: Landina, several venues, curated by Lorenza Boisi; IBYM, I'll Be Your Mirror, a project by Sophie Usunier, at the Arianna Giorgi's Studio, Milan; Grand Hotel, curated by Serena Fineschi and Marco Andrea Magni, Riot Studio, Naples; The Studio Chronicles, with a critical review by Bianca Baroni, RH Contemporary Art, New York; Heads, curated by Vera Portatadino, Yellow, Varese; Profil Perdu, curated by Karen Huber, Gallery MC in partnership with Karen Huber Gallery, New York; Origin and geography in the digital era, curated by Alessia Armeni, Italian Institute of Culture, San Francisco.